Students at the Shashemene School for the Blind in Ethiopia sing and pray together after breakfast. The school is giving blind and partially sighted students lessons in faith, hope and independence. Learn more in The Future at Their Fingertips, in the Winter 2015 edition of ONE. Hidden child labor in refugee camps (The Guardian) There are no figures on the informal Syrian labor force in Turkey but there are almost 2.3 million registered Syrian refugees living in the country, according to the U.N., with about 9 percent of them in refugee camps. The rest have to provide for themselves with no financial support from the state. An expert from the Centre for Middle Eastern Strategic Studies has suggested around 250,000 Syrian refugees are working illegally in the country, with a recent Human Rights Watch report claiming child labor is “rampant.” Many reports of illegal working come from the garment sector, the country’s second largest industry. Some three hundred Muslim scholars met this past week in Marrakesh, Morocco, at the invitation of King Mohammed VI to discuss the situation of (religious) minorities in “Muslim Majority Communities.” The kings of Morocco and Jordan are well known for their efforts to promote respect for human right in Muslim countries. Perhaps more importantly — and providing the real challenge — the Declaration calls for Muslim scholars the world over to “develop a jurisprudence of the concept of ‘citizenship’ which is inclusive of diverse groups.” This is significant because Christian leaders in the Middle East since the so-called Arab Spring have been stressing the importance of citizenship, which is a relatively new concept in Islamic Law. The Declaration merits closer study of the original Arabic text. It would also be important to see the list of signers, if such exists. Nevertheless, especially in the context of “A Common Word between Us and You,” even the Executive Summary of Marrakesh Decaration is an important development in the attempts of Muslims to respond to the crisis of extremism in Islam. One can only hope that those who ask “Why aren’t they speaking out again terrorism?” will have the opportunity to read this text. The New York Times this week posted this brief documentary, created by a 17-year-old Syrian girl named Khaldiya, who lives with her family in a camp for Syrian refugees in Jordan. It’s part of an ongoing series in the Times (called “Op-Docs”) produced by independent filmmakers who have received support from the nonprofit Sundance Institute. When I arrived at the Za’atari refugee camp in Jordan three years ago, I was overwhelmed. My family left our village in the region of Syria where the revolution began, after the area was bombed. My mother and six younger siblings and I suddenly became eight of the world’s 4.5 million Syrian refugees, and we have been living with 80,000 of them in our camp ever since. Life in a refugee camp was different from what I’d expected. While it is hard in many ways, it has challenged me to be stronger and more independent. Now I am sharing my experiences in this Op-Doc video, which I made through a media workshop at an activity center in the camp in 2014, working with a visiting filmmaker to film as much of my life as I could. Watch her video, which is called “Another Kind of Girl,” below. In the Winter edition of ONE, journalist Don Duncan profiles Syriac Christians “Coming Home” to Turkey. Below, he offers some additional reflections on the political situation in the region. Thoughts of politics kept coming to my mind when I was reporting this story about the current state of Christian life in the Tur Abdin region of southeast Turkey. Through the numerous interviews I conducted with members of the community for the article, I realized that, although the community in Tur Abdin today is small, at just 3,500, it nonetheless represents a variety of stances with regards to political participation and its uses. By and large, there seems to be two main schools of thought in the community. The first school seeks to keep a low profile, attempting to gain more freedoms without much political agitation. These people, an old guard of sorts, tend to look back, recall past atrocities, and reminisce about the time when Christians ruled Tur Abdin. The second school, which is a kind of new guard in the community, is one that is a little bolder. It believes that that rights are not granted but rather taken, through overt political engagement with the system and through political agitation. It is in this second school of political thought where one finds the new faces of Christian political representation, like Mardin’s co-mayor Februniye Akyol. These new faces are attaining representation under the broader political current of the Kurdish movement for democratic change, itself a product of the 1999 ceasefire between the illegal militant Kurdish group, the PKK, and the Turkish state. Regardless of their different approaches to progress, the reality is that both political schools in Tur Abdin’s Christian community currently face the fact that they are numerically insignificant — both in southeast Turkey and in the country as a whole. Unlike the days prior to the 1915 genocide, when Christians’ numbers meant they could formulate and apply political will directly within the regional and national context, today their small number means they must always work via a more powerful proxy. The evolution of Kurdish politics (from armed insurrection to pro-minority political engagement) over recent years has produced a window of opportunity through which Christians can push for and attain more rights as a minority. However, the Christians and their hope lie on unstable ground and they have no control over factors that can change the playing field. That ground is being shaken even now. The ceasefire between the Turkish state and the PKK crumbled last July and hostilities between the two players have flared. This may well cause the Kurdish political ethos to swing back from democratic participation to the stance of armed conflict it had prior to the 1999 ceasefire. If this happens, the political window of opportunity that the Tur Abdin Christians have recently found and exploited will snap shut and they will find themselves in political obscurity once again. But for now, the low-key, pacifist and non-confrontational approach of the old guard in the Tur Abdin Christian community will not be without worth — making slow and silent progress in attaining new rights and privileges for its community. 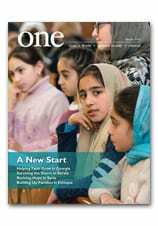 Read more about Christians returning to Turkey in “Coming Home” in the Winter 2015 edition of ONE. And to get a sense of life in their homeland, and how they are adapting, check out the video below. Orthodox Metropolitan Gennadios of Italy, Pope Francis and Anglican Archbishop David Moxon, the archbishop of Canterbury’s representative to the Vatican, give a blessing at the end of a prayer service at the Basilica of St. Paul Outside the Walls on 25 January. The service concluded the Week of Prayer for Christian Unity. Read more about the service here.